'Bogheid', the Helen Porter Pryibil estate designed by Delano & Aldrich c. 1938 in Glen Cove with landscaping by the Olmsted Brothers. Pryibil was the daughter of William Henry Porter, partner at J.P. Morgan & Co., and built her estate on the site of Porter's 'Bogheid' which had been demolished c. 1930. 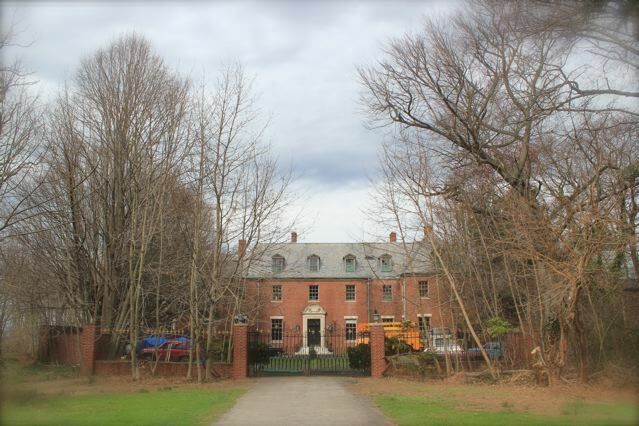 Pryibil willed the house and grounds to the City of Glen Cove following her death and a golf course was built around the property. 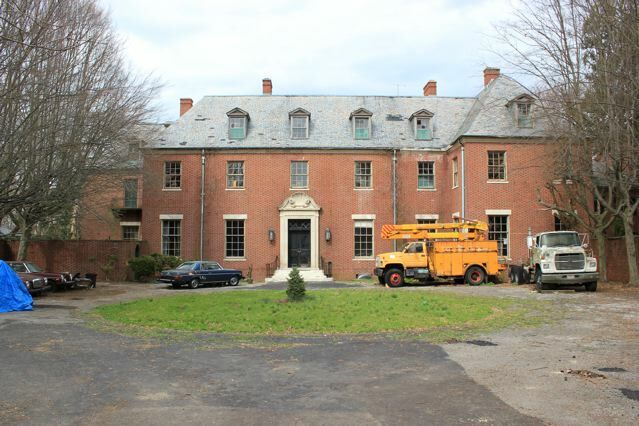 The house was eventually sold to Martin Carey, owner of 'Winfield Hall' also in Glen Cove. Click HERE to see 'Bogheid' on google earth and HERE on bing. Photos courtesy of Eddie Crowley. These photos were taken with expressed permission. 'Bogheid' is a private residence with no public access. Wonderful photos. And the abandoned boats and the utility trucks give a certain je ne sais quois---and aesthetic counterpoint. With photos taken with permission, one then hates to turn around and criticize the person who gave that permission---but unfortunately, the inevitable question is what is it about a man who has purchased three palatial houses and lets them fall into ruin. Apparently it is multi-generational. Not long ago, the Carey daughter put out word that she was going to restore Seaview Terrace, her father's property in Newport, and more recently the word is out that it was all just hype and the house continues to decay. I can see that Bogheid is maintained to the usual Carey standard. I'm told that he and his wife lived here for quite awhile with no running water. 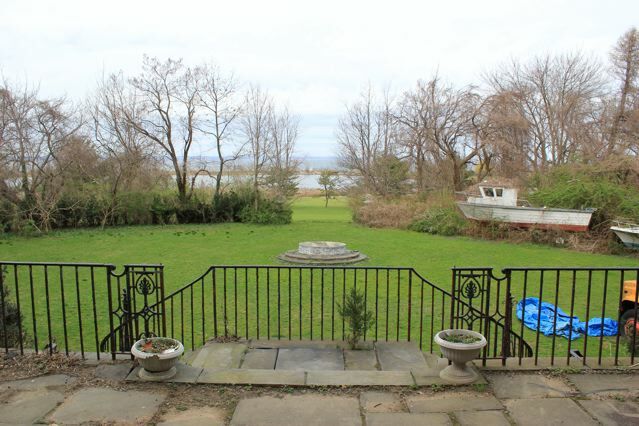 Not totally apparent in these photos, but there is an indoor tennis court attached to the east end of the house. And the interiors are sheer perfection- D&A at their best. If you look at the north front of the house, you will see three windows below the loggia (The loggia fronts the dining room- huge and splendid with an eliptical end, if I recall). 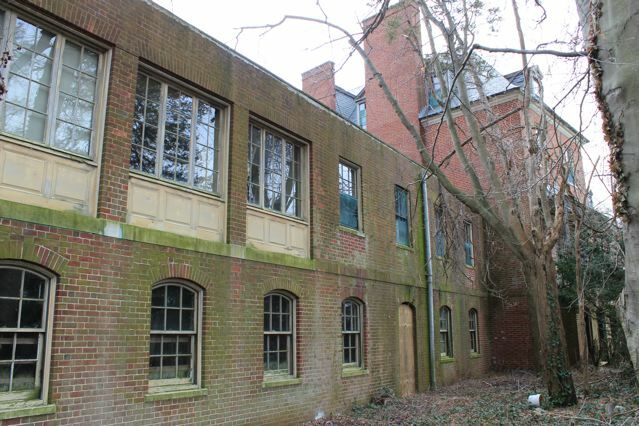 The room behind these ground floor windows is a large "playroom" and bar, with a two lane bowling alley. In the mid '70's Bogheid was totally abandoned, and I spent many happy hours exploring the place. Judging from these photographs, it was in better shape abandoned than it is now, under Carey's inimitable stewardship. Has anyone seen photos of the original Bogheid? it must have been breathtakingly large- or hugely ugly- to have been torn down and replaced by this enormous house. Some recent interior shots tomorrow. I shudder in anticipation of what we will see. I think that I've posted this before, but Helen Porter Pryibil also had a townhouse in New York on East 69th Street. I believe that it was also a D&A creation. It has been divided into seperate apartments and a friend of mine has what I think is about the best studio apartment in the world in the building- the huge dining room which, like Bogheid, has a loggia overlooking the back garden. I just can't look at these photos anymore. They make we want to weep. Here's a confession- I'm a sucker for reality TV- If they're addicted to something or hoard, I'm all eyes and ears. I'm all over the addiction to "meth" and I know all about folks who hoard everything from old newspapers to feral rats. But what about those who hoard grand old houses? Perhaps we have a reality star in the making with Carey. Sad to see all that beautiful wrought-iron rusting away. I can only imagine what we'll see tomorrow. I had taken a Gold Coast tour back in the 80's or 90's sponsored by some group and visited a few Glen Cove and Lattingtown mansions. This mansion was on the tour and upon entering Carey and his wife greeted tour guests infront of their crumbling marble fireplace mantle in what I presume was the living room, facing north. The circular staircase railing was loose, windows broken, water stains on the ceilings and debris piles everywhere. He proudly said he was living in the home and restoring it to its former splendor. That was 20 to 25 years ago and it still looks like a dumping ground. What is the correct definition of delusional? There obviously is some mental disfunction that obscures a persons sense of reality. After his ownership there is no hope that this home will ever be restored in the future, but instead demolished thanks entirely to the ownership of the Carey family. D&A originally deigned that institutional like wing (img_1766) or was there a brief commercial reuse period in its life? When looking at the Bing map I initially saw a horseshoe building to the left and thought it retained some equestrian charm ... then I saw it was a driving range. Ouch. Putting aside the less than sympathetic positioning of the driving range (although that can be easily dismantled) this can ultimately either become a lovely club house or a very ritzy on-course private home nestled in 3-acres. All is not lost - yet. The sad fact is that despite a home looking like the set of "The Money Pit" the tax bill still is tremendous. A further word on Seaview Terrace in Newport ~ as mentioned in Down East Dilletante's comment at 7:45 a.m. A friend's grandaughter, who occupied the mansion during her senior year at Salve Regina University, gave us a tour of the place during the summer of 2009 . . . the last year it served as a dormitory for the students. 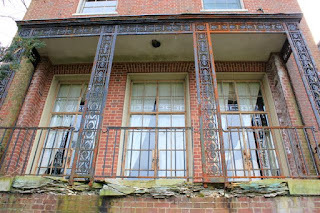 I took many photos of the interiors at that time and was told that after the students departed, that year, that the mansion would be converted to a top-of-the-line bed and breakfast by the Carey family who occupied the second floor of that south-west wing ~ originally the Bradley family's bedrooms! I often pass the place and, outwardly, have yet to notice any change in the building. 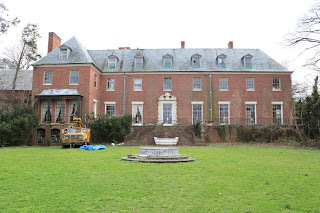 One would think the family could continue the lease arrangement with Salve Regina University - at least for a portion of the estate - to continue the revenue stream and selectively restore as needed. KJ- at one point, the City of Glen Cove used Bogheid to store surplus equipment- snowplows in the summer, etc. I imagine that the wing you refer to was added then. I don't remember it, but it must have been there. I own a copy of the Sotheby's catalog of the auction of Bogheid's contents after Helen Porter's death. The house was filled with exactly the sort of wonderful English furniture that you would suspect. One of Helen Porter's God- daughters was the mother of a friend of mine, and her wedding took place at Bogheid in the late 1950's. My friend assures me that there is a wedding album which he will share with me that has plenty of shots of the house. This post has reinvigorated me to press the issue. I'll see if he will agree (with Zach's OK) to have some of the photos posted, if indeed they show enough background. Perhaps Mariah Carey could do something with it. Interiors tomorrow? I can't wait! Magnus, use physical force if necessary to get permission to post a few of the wedding pictures. Blackmail, bribery, whatever it takes. Kellsboro, one suspects the institutional wing you refer to is actually the indoor tennis court and playhouse wing, carefully screened from the grounds by landscaping. Would love to see photos of the original house if located. So the owners have passed up money by renting out the tennis structure to store some of Glen Cove's municipal equipment and from the college in Rhode Island for housing students and have elected to keep both places vacant and rent-free. What smart business decisions. Maybe the money could have been used for something like maintenance? 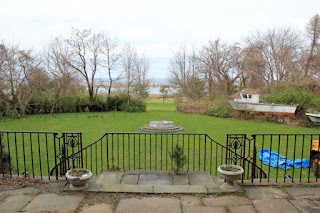 Anon is probably correct in stating that while this house had a fair chance of being made into a comfortable home back in the 1980's, with a beautiful view overlooking LI Sound I might add, under Martin Careys ownership and neglect it will end up on the demolished list soon enough on Zack's blog. After decades of abandonment, this home is nowhere near habitable and aside from the cosmetic, the considerable cost to now completely replace plumbing, electrical, update bathrooms, kitchen, repair windows, doors, roof, plaster walls, masonry, correct structural issues no doubt, well nobody will undertake a renovation of that magnitude. Thank you Martin Carey for your contribution to preservation on Long Island and Rhode Island. 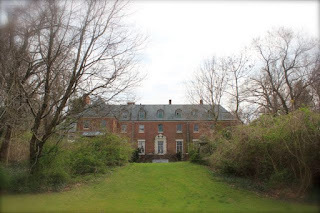 If not mistaken brother Hugh did the same thing with a large Victorian home on Shelter Island, purchasing it, promising a renovation, but letting it sit vacant for years until the place was sold in very poor condition to a developer. Maybe crazy does run in families? And about that reality show magnus? Richard Jenrette hoards grand old houses and I wish he hoarded a few dozen more. Martin Carey just destroys them. Man, this guy Carey really knows how to take good care of these places doesn't he? Sad as it makes me to see these images . 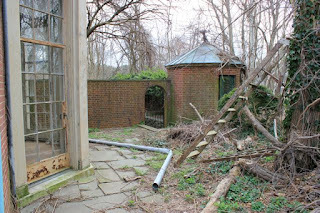 . . still a BIG Thanks to Ed Crowley for taking the time and effort to record the place for posterity ~ near-ruin or not. And Thanks to Zach for the posting ! She loved mice and had a huge collection in practically every material known, and she loved champagne which she consumed in sufficient enough quantities that her predeliction for it was remembered decades after her death. When Bogheid was abandoned in the 1970's, the wine cellar still contained a vast quantity of champagne bottles, all, alas, empty, and basement storerooms were full of old curtains and lampshades. I remember that many of them had tags that indicated they came from the "old house". I also believe that Mrs. Pryibil sold the property to the City of Glen Cove before her death, with the proviso that she remain there for her lifetime. Why the City sold the main house is a mystery. Our current mayor told me that he approached Carey about buying it back- or- gasp- having Carey donate it. You can imagine how far that conversation got. Isn't a bad steward better than none, at least keeping the vandals at bay? 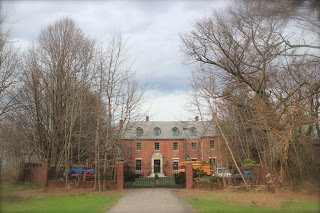 An obvious candidate for Country House Hoarders on HGTV; but what to call the disorder? Mansionalia? Looking at the photos again convinces me that DED is correct (surprise, surprise) and that structure to the east of the house is the foundation of the indoor tennis court. If I remember correctly,however, the playroom and bowling alley were under the main house: The front hall ran from the front door to the door wih the large marble surround on the terrace. It was bisected about halfway along by an equally wide hall that ran east, culminating in a large staircase that both ascended and descended. If you descended, you found yourself in an equally wide hall (creepy with no lights)that followed the outline of the stairhall upstairs. The playroom and bowling alley were on the north side of this hall, basically below the dining room and large sitting room that ajoined it on the floor above. If there were enough of us on the expedition to give us collective courage, there was also a door to be explored at the end of this hall which led to a huge sub-basement with the boilers and water tanks. I was taking a photography course in college at the time and wanted to use Bogheid as a subject when I was home one week-end. In typical college style, I delayed taking the photographs until there was about 15 minutes left before I had to return to school. I couldn't get anyone to come with me, and it was the first and only time I was in the abandoned Bogheid alone. The sun was setting and I was so terrfied that it brings chills to me 35 years later. My photograph of the abandoned living room won first prize at the school's art fair that year, so it was worth it. Sadly, I can't find that photograph for the life of me. Sorry to bang on and on. Bogheid conjures many memories. Even in this state the house has more character and style then anything that would replace it. What arrangements did Carey and Glen Cove make to allow this to happen? You might remember the threatening tone given when message was sent to Seaview Terrace website when confronted with his lack of efforts. "I'm told that he and his wife lived here for quite awhile with no running water." Oh for one of Zach's put-a-face-to-a-place photos of this couple so I can put my wild imaginings to rest. Bogheid, the name of the Porter ancestral home in Scotland (i think) roughly translates to "place by the rushes" D&A took this into consideration with much of the iron work -- the entrance court gates and interior stair railing are made up if overlapping bullrushes-- magnificent. The other most magnificent detail of the house is the giant basket of puppies carved in stone over the back door. another interesting tidbit to add -- HPP smoked little tiny pastel cigarettes -- and had a small bell she rang when she needed a light- the maids would come running with lighter in hand. oh, I forgot to add... I would give my right arm for this house. BCD--can't argue with your willingness to give up a limb. Delano and Aldrich were the real couture architects of their era--their houses always look fine and traditional at first glance, but with each subsequent glance, the details and imagination just keep on revealing themselves. BCD- That brings back memories- if I remember, there was a tobacconist in Manhattan called Nat Sherman that sold those little cigarettes in colored rolling paper. They also sold cardboard cigarette holders. A friend of mine's mother used both. I thought it was the last word in chic. Many thanks, alright then, the images of Ryan Gainey and Lynn Yeager in the roles of Mr. and Mrs C will have to persist. I remember this wonderfull estate when cows roamed the fields . As a kid I watched as it was turned into a golf course and the contents of the estate were auctioned off. The Prybils also had a warehouse in downtown Glen Cove to store an abundance of collected items. One in particular was I belive a Stuts Bear C at that was found at the bottom of an elevator shaft . 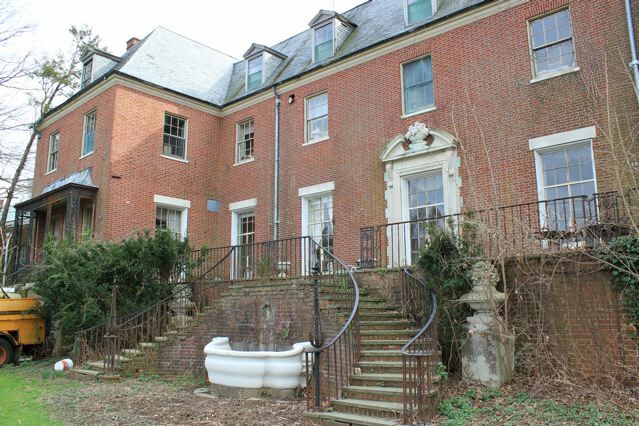 Martin Carey is known for purchasing lavish historical manors and letting them rot. He is a nut job. 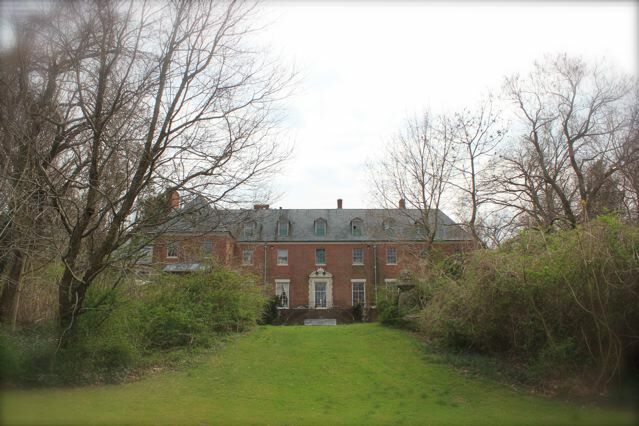 He owned a mansion in Lloyd harbor that partially dated back to the late 1700's. he bought it in the 70's and residents who lived on the street from the 1940's had to watch a beautiful home slowly fall apart. It was eventually purchased and demolished in 2003. They left cars boats and construction equipment on the property to rot. Before it was demolished I went in and took pictures. You could tell they stayed there sometimes. How I don't know the moisture mold and rot was unbearable. There was even. Hot plate in the kitchen which I'm guessing they used for boiling water since it was no longer safe to ignite the gas stove. It was a shame when the house was destroyed. He should be institutionalized.